Let us die young or let us live forever, we don’t have the power but we never say never, sitting in a sandpit, life is a short trip, the music’s for the sad man, let a player play. Play edge-of-the-seat golf is all Martin Kaymer did to win The Players Championship Sunday. Kaymer finished at 13 under winning by one stroke over Jim Furyk to join a select group of golfers. Tiger Woods, Phil Mickelson and Adam Scott are the only other players to win a major, a World Golf Championship and The Players Championship. Woods, nursing a back surgery, could not defend his 2013 title. The storyline of the tournament was narrowed down to three golfers. First was Jordan Spieth, looking to become the youngest winner of The Players and fourth winner in his first appearance. Spieth started Sunday tied at 12 under through the first three rounds. Spieth was bogey-free through 54 holes. His first bogey came at the par-4 5th-hole dropping him to 13 under. When it rains it pours as his fairway shot on the 10th hole was not worth remembering. It would roll off the green leading to a bogey, his third bogey in six holes. Spieth finished tied with Justin Rose for fourth at 10 under with a final round 74, while Rose closed at 69. Jim Furyk at age 44 proves it is just a number. The 2003 U.S. Open champ had a taste of The Players Championship Sunday. Furyk knows TPC Sawgrass located in Ponte Vedra Beach, FL very well as it is his home course. On the par-4 4th-hole, Furyk would make birdie moving him to 9 under. Making a charge on the par-4 10th would equate to another birdie taking him to 11 under. After a 90-minute rain delay, Furyk closed with a final round 66 to take the lead in the clubhouse at 12 under with Spieth on the prowl. Furyk had to settle for a runner-up finish for the second straight week and a $1,080,000 check to cheer him up. Kaymer a former world No. 1 and major champion knew a win on Mother’s Day would mean more than a $1.8 million check and a nice trophy. His mother, Rina, died of cancer in 2008, shortly after Kaymer won the BMW International Open in Germany. “I think about my mother everyday. I don’t need a Mother’s Day,” Kaymer said. He gave the gallery that included mothers a show. Kaymer’s second shot on the par-5 9th-hole landed in the bunker, but he followed it up with a beautiful shot to birdie the hole and move to 14 under. His birdie on the par-5 11th-hole moved him to 15 under and four shots ahead of Spieth. After the rain delay on the par-4 15th-hole, Kaymer found himself in the bunker again. This time he would double bogey and only have a one shot lead over Furyk. He made it entertaining on the famous island par-3 17th as his tee shot would bounce on to the green, roll on the fringe nearly avoiding disaster of falling into the water. Kaymer would then knock down a clutch 30-foot putt for par. A miss would have led to a tie with Furyk or a possible loss. “It was a very strange way to make a 3,” Kaymer said. The golf was amazing to watch down the stretch. I was one of the few watching. No Tiger. No Phil. 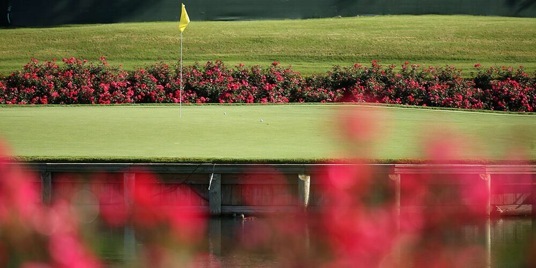 The Players Championship had the lowest overnight TV rating since 1998 for the final round of the tournament. Last year it tied an all-time high with Tiger Woods winning. Kaymer moved from 61st to 28th in the Official World Golf Ranking. It sure is a global game as he becomes the sixth foreign-born player to win on the PGA TOUR this season. Play on Players.